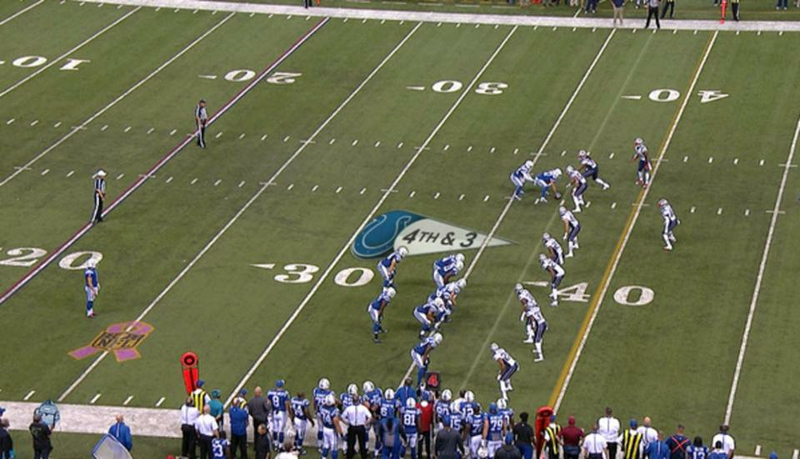 On a fourth-and-3 in the third quarter of Sunday night’s game, all but two Colts players lined up on the right side of the field, almost completely outside the numbers and two yards off the line of scrimmage. The attempt to confuse the Patriots, and perhaps try to draw them offsides, failed. Instead, Griff Whalen, who was essentially lined up at center, snapped the ball to Colt Anderson, who was swallowed up by Brandon Bolden, giving the Patriots the ball back. A flag was thrown for an illegal formation. “The whole right side of the line was not on the line of scrimmage,” the official said. “That was insane,” NBC commentator Cris Collinsworth said. 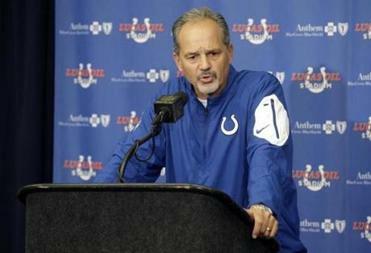 Colts coach Chuck Pagano took responsibility for the botched play. Coach Bill Belichick said the Patriots were expecting the Colts to run some type of trick play. “We expected this to be a gadget game in the kicking game, the onside kick, some kind of fake — fake punt, fake field goal. The punter ran a sweep against Tennessee a couple weeks ago. That’s something they’ve done in the past. Patriots defensive end Chandler Jones, watching from the sideline, said he thought the formation was peculiar. It was quickly called the dumbest play of all time, turning up some confused and funny results on Twitter. Pete Carroll off the hook for a few hours. We now have a call almost as bad as the slant pass on second and one from the one. Idiots. Chuck Pagano just rolled out the red carpet for Nick Saban with a bizarre, poorly-executed, illegal fake punt play. It was supposed to be the Patriots embarrassing the Colts. Instead it was the Colts embarrassing themselves with that non-punt fiasco. I'm sorry I just don't know how tomorrow is spent discussing anything other than the Colts' "fake punt." Pagano was in good shape; the Colts weren't getting embarrassed and still had a chance to win. And then he does that. Colts defense had actually done a decent job keeping this game close before it got hosed by that bizarre playcall.